The National Lotteries Board (NLB) was established in 1998 through the promulgation of the Lotteries Act (No. 57 of 1997). The NLB administers the National Lottery Distribution Trust Fund (NLDTF) which contains a dedicated portion of money from the National Lottery that is meant for distribution to ‘good causes’. Changes to the Lotteries Act of 1997 have been drafted and the Department of Trade and Industry is inviting the public to comment on the Draft Lotteries Amendment Bill 2013. This infographic shows the passage that the Lotteries Amendment Bill will follow through Parliament. 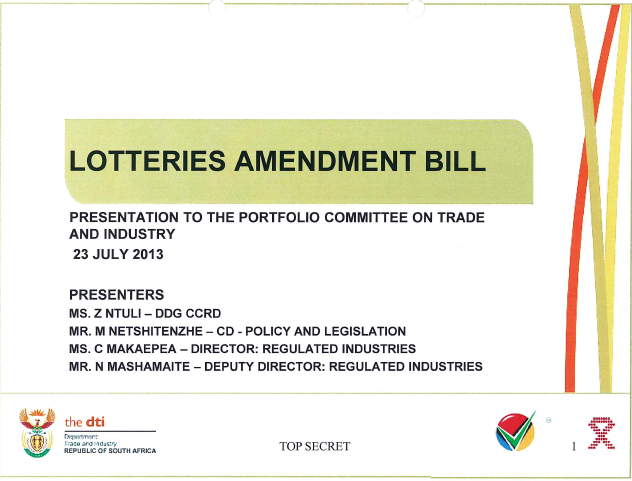 The draft Lotteries Amendment Bill was published by the Department of Trade and Industry(DTI) in May this year through a call for comment. 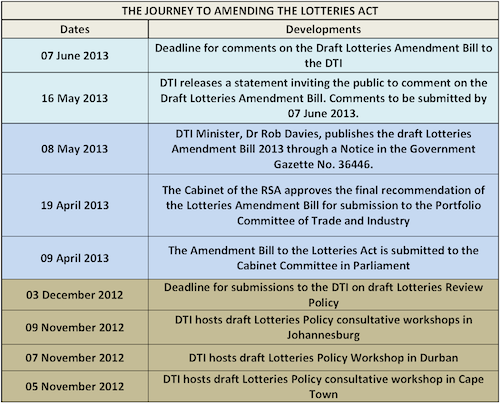 The deadline for comments on the draft Lotteries Amendment Bill(the Bill) to the DTI was 07 June 2013. The Bill however still needs to be presented to the Portfolio Committee(PC) on Trade and Industry in Parliament. Once the Bill is before the PC on Trade and Industry they will then invite the public to make submissions on the Bill. This is the first time since the Bill was established that it faces amendments that could change the entire structure of the National Lotteries Board(NLB) and the manner in which funds from the National Lotteries Distribution Trust Fund(NLDTF), this is an opportunity that may not be available for a long time to come. 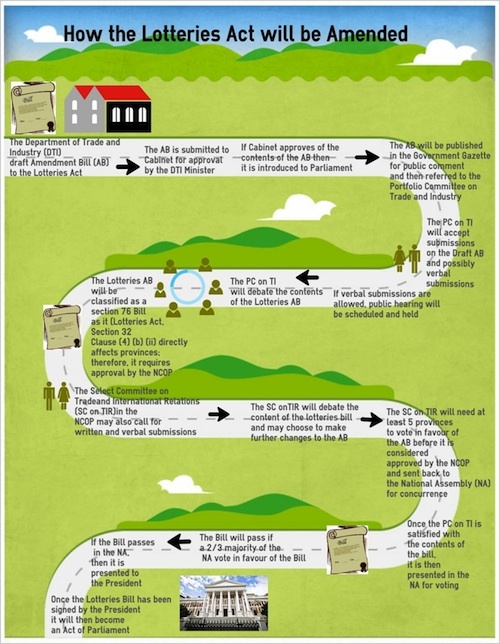 This is a timeline of statements and developments towards amending the Lotteries Act (1997). 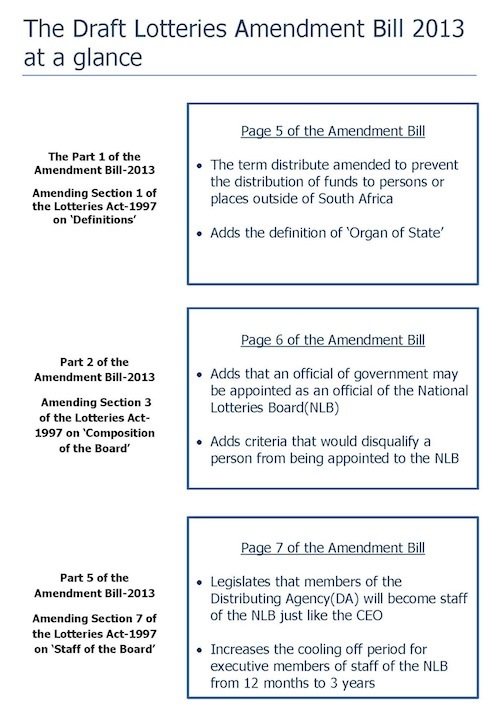 Here is a brief fact sheet on what is included in the draft Lotteries Amendment Bill 2013. We trust that it will be of interest and assistance towards understanding the current proposed amendments to the Lotteries Act 1997.